The fee is $30 payable to the Chess Club of Fairfield County through the online registration below. The Chess Club will provide instructors and chess set for the workshop. Scouts MUST have a basic understanding of Chess and how the pieces move. 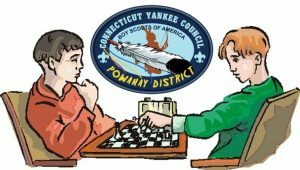 In order to complete the Chess Merit Badge Scouts need to compete in a chess tournament scheduled at the May 18 STEM Spring Camporee. There is a $17 joining fee to Chess Federation For those that would like to be nationally ranked at the May 18 Chess Tournament. The Chess Club can provide information on how to join. Parents do not have to accompany their son to the workshop but Scouts must be picked up by 11:30 am. No Scout will be permitted to leave the Chess Club without a parent or a parent-approved adult.